For years pop culture has used the concept of aliens or some form of extra terrestrial being in order to explain periods of history that have often been deemed unexplainable. One of the of world’s greatest historic icons – the Great Pyramids of Giza – is subject to all manner of other-worldly conspiracy theories. In the fourth Indiana Jones – which was widely met with disappointment among diehard fans – was the insertion of aliens into the stories in Peru. One side or the other, passions can run very high when discussing conspiracy theories and the science – or lack there of – around them. On April 15, 2015 a video surfaced on YouTube showing the culmination of a yet-to-happen debate between Graham Hancock and Egypt’s former Minister of Antiquities Dr. Zahi Hawass. Though the video is only about two minutes long and cast in poor lighting, the ‘lively’ nature of the argument has generated over 100,000 views in the month and a half since its release. And trust me – it’s not because archaeological debates are riveting viral material – it’s all about the drama. This argument centered around Hancocks showing of a slide that contained Robert Bauval’s Orion Correlation Theory in which it is believed that the stars in the Orion Constellation have a relationship to the kings of the Great Pyramids of Giza. However, this has been regarded by many scholars as pseudoscience or junk science. For archaeologists and other scientists that have spent lifetime examining ancient peoples and understanding the depth of their technological and engineering capabilities, it may come off as an insult to surmise that astrological-type pseudoscience has a place in the world of academia except for its role in Archaeology 101 of what NOT to do. Keeping in mind that this dramatic debate encounter caught on film was more than simply an argument, but a deep fundamental disagreement, was Dr. Hawass still unwarranted in his fervent disagreement to the Orion Constellation theory and its proponents? Check out this week’s episode entitled “Why Aliens? Ancient Cultures Deserve More Credit” HERE. In preparation for writing this blog I scanned the Internet looking for images – and came across the horrific news of the Ethiopian Christians killed by ISIS in a newly released video. As I struggled to digest the recent news from ISIS, I tried to determine what I wanted to emphasize most in this new blog – and although history seems to continue to repeat itself, one thing that is left out is the reality of the situations – religion does not justify the killing of others.Throughout history we have seen the repeated loss of innocent lives in the name of one religion or another – during the crusades, many Muslims lost their lives at the hands of Christians. Yet at no point in time have these values of death in the name of god held to the true message of religion – peace, alms for the poor, and understanding of the plight of others. Baghdad was once known as the ‘City of Peace’ (Madinat al-Salam) – but that was in another lifetime. And today, even with the trillions of images that exist online, one would be hard pressed to find any images representing Baghdad and peace.Our media perpetuates so much information about the Islamist terrorists whose campaigns are sweeping the Middle East and North Africa – but what is often left out of the media is the distinction between Islamism and Islam. One of the first things that is important to understand about the Jihadi Salafist ideology that is sweeping the world today is that this is NOT true Islam. In an effort to illustrate that Islam is at its core a religion of peace, I attempted to find images to display this for my blog – I was truly shocked at the dearth of imagery available to illustrate this point. One of the few stories available in the “recent memory” of the Internet that truly illuminated Islam and the peaceful nature of the religion came out of a period of turmoil – the Arab Spring. During the 2011 Egyptian Revolution, while Egyptians rallied together,Muslims stood guard to protect the Coptic Christians from violence during prayer – and the Copts did the same. Every time an image of a group like ISIS or Ansar Al Sharia is reproduced, or clicked on, it only feeds the propaganda machine these groups are trying to proliferate. As they bastardize religion by using it as a justification for violence, they are at the same time killing the true peaceful nature of that religion in the minds of those outside of it – feeding the Islamaphobia beast – and furthering their cause against those for hating Islam. Let’s stop giving them free propaganda. Send the ArchaeoVenturers Project your images of how Islam represents peace. Let’s change the dialogue together. Ta Prohm (1186 CE): Originally named, Rajavihara (Royal Temple), is one of the most visited temples in the religious complexes, most likely for its unique look of ruined beauty mixed with invasive natural elements (in this case, ever expanding jungle trees that thrive amidst the native temple architecture and encapsulate the historic remains). The word “Ta” means ancestors and “Prohm” originates from Brahma, Hindu god of creation. As an ode to inaccurate archaeological depictions, which Katie and I talk about in the #AVProject (), I must not forget to mention that the famous Lara Croft: Tomb Raider movie was filmed here, one of the only Cambodian sites depicted with accuracy in the movie- and I must have heard at least 30 different tourists mention it in the hour we wandered around. Our guide said that after the movie came out, there was certainly a larger influx of questions about the temple’s role in the movie, how it was filmed, if Angelina Jolie had been there, etc…, and that many of these questions were still asked today. Because Ta Prohm’s beauty literally lays in ruin, there is a major restoration project being undertaken all over the UNESCO World Heritage Site, as you can see in the video. This restorative conservation is a partnership project of the Archaeological Survey of India and the APSARA (Authority for the Protection and Management of Angkor and the Region of Siem Reap) that has been ongoing since 2004. It is said to be a difficult task as the teams are avoiding vegetation removal, which is used to illustrate “how the trees and the complex coexist.” Oddly enough, Ta Prohm has also been at the center of creationist/evolutionary debate in recent years as a ‘stegosaurus’ has been discovered (see below image) amongst the depictions- judge for yourself! Bayon Temple (dating from the 12th century CE): Bayon was the very center of Angkor Thom (Big City), which was the capital built by King Jayavarman VII. It’s position is the manifestation of the intersection between heaven and earth. The many faces of Buddha is how I recall this temple site- Mr. Raty said there are over 2000 large faces carved on the 54 towers! He mentioned that many people point out that the Buddha’s look as though they are smiling and that some have made comparisons to the Mona Lisa’s cryptic smile. There is a tourist stop here that no matter how hard thou doth protest, you must take a rubbing/kissing nose photo with this one Buddha, reminiscent of those timed photos taken at the leaning Tower of Pisa. Between 1995-2001, UNESCO and the Japanese Government Team for the Safeguarding of Angkor (JSA) conducted an extensive research and conservation project at this temple. The World Bank warns that Bayon, and other temple towers, are sinking into their sandy foundations as the hospitality industry drains underground water reservoirs- something to seriously consider as a foreign visitor. Phnom Bakheng (Built at the end of the 9th century): Known as “sunset on the hill,” this is where to be when the day comes to a close- and you know you’re in the right spot as suddenly hundreds upon hundreds of people have the very same interest in watching dusk fall from the top of the temple mountain. And it’s certainly a hike up, and at the top you realize why- it has an unrivaled view of the valley of Angkor Wat and the surrounding temples. I’ve never seen more selfie sticks in my life until that moment waiting for the sunset- so many selfies to be had in the twilight of evening (if you can’t beat ‘em, join ‘em)…. However this popularity comes at a steep price: the World Monuments Fund puts Phnom Bakheng is one of the most endangered of all the complexes. More than 3,000 tourists push their way to the top, up the narrow stone staircases every single evening (myself and friends included). Please stay tuned for Chapter 4 and Final in “Global ArchaeoVentures: The Diver Travels to Vietnam” also known as “An ArchaeoVenture to Vietnam” where a montage of travel and scuba dive footage await. So Katie (The Digger) and I decided that if either of us ever have the chance to travel to interesting places with deep histories (which most places are and have), then we would not waste the opportunity and would share them as special ArchaeoVenturers episodes! It goes without saying that every country, city and historic site has a fascinating and complicated story to tell, and we only hope that you enjoy watching these special videos and reading our blogs as much as we love sharing them with YOU! So this past holiday season, you may have seen on our ArchaeoVenturers social media accounts (Instagram, Twitter, Facebook), that I was fortunate enough to have the opportunity to visit some friends of mine who had moved literally halfway around the world from good ole’ Washington D.C. (14, 392 km in fact!) to a part of the world that I had never visited before- Southeast Asia, specifically the capital of Cambodia- Phnom Penh. The Kingdom of Cambodia, once known as the Khmer Empire, saw independence from the French in 1953. Today, one of their largest sources of income has become the tourism industry. Who needs a better excuse to visit friends when you have a warm bed and Cambodian iced coffee on the other end!? If you want to visit a foreign land, my best advice would be to visit with people who are or have become locals- you meet and see things that tourists never get to experience, and luckily, such was the case here! My two friends and I packed our bags and spent the almost two days of traveling getting to the city of Siem Reap, in northwest Cambodia, where the temple complex of Angkor awaits eager tourists. Our friends in the capital had to wait a few days to see us, because as a history buff and archaeologist, Angkor was a place I could not miss out on, and also, they had already visited a month earlier. This first video in our special Global ArchaeoVentures series is about my friends and my journey traveling from JFK on Eva Air (yes, the Hello Kitty airline!) through Taiwan to Phnom Penh, and straight into a 6+ hour taxi ride with a driver who easily hit 90 mph on roads that had more potholes than all the potholes I’ve ever seen combined! And yet, we enjoyed (and were exhausted) every minute of it! Our driver stopped only once for petrol (which is sold on the sides of the roads in used cola bottles for convenience) and to grab us all bamboo shoots filled with rice and beans for a road snack. It’s hard to switch from light hearted travel/adventure mode in the videos to writing more about what I heard in this portion of the trip. The most enlightening part of our journey to Siem Reap, was learning more about the destruction of the Khmer Rouge from our driver, who’s family had luckily survived the massacres. Between 1975 and 1979, a genocide organized by the ruling Khmer Rouge government, killed roughly one fifth of the country’s population- from all walks of life and all echelons of their society, echoing memories of the Holocaust. Despite their ousting in 1979, the Khmer Rouge continued to exist until 1999, and the effects of their regime remain ever present in contemporary Cambodian society. Our driver told us that the bamboo with rice and beans snack we were eating, was a popular staple during the war because of its easy ingredients and simple preparation. What I was truly inspired by, and I regrettably didn’t manage to catch this part on film, was how positive our driver spoke about Cambodia’s future despite all that had happened to his family and culture. The world is doomed to repeat atrocious acts of violence if we fail to learn from history, something happening at an alarming rate with ISIS/ISIL in the Middle East right now. Luckily, there are strong communities of people willing to fight back and save what is irreplaceable. That is what happened in Cambodia, and although it is still recovering, the positive and enduring attitudes of their countrymen bring hope for the future. Ending with that somber note of reflection, please stay tuned for Chapter 2 in “Global ArchaeoVentures: The Diver Travels to Cambodia” also known as “An ArchaeoVenture to Cambodia” where the World Heritage Site of Angkor Wat is highlighted. Please visit Youtube for Chapter One Episode! or View Below! Hello Kitty phone at the Taipei airport! First SE Asia selfie! Running from the airport in Phnom Penh to a 6+hr taxi ride to Siem Reap aka Angkor! Half way stop on a local river to stretch our legs! Comfy travel fashion all the way! Hannah, Paul and I putting on our best fake smiles after almost two days of traveling! Chapter Two of this special ArchaeoVenturers series begins in Siem Reap, with my friends and I joining up with our tour guide Mr. Raty (highly recommended services! ), who was born in the province. Along the way to the temple complex, Mr. Raty told us that while being a local tour guide is one of the more profitable professions in the area, they must take many expensive tests in order to become certified and to stay licensed, year after year. He is the only one in his family to be a tour guide and was very proud of how hard his family, in particular his mother, works in the agricultural realm of area. He also had one of the most infectious smiles I have ever seen- this was apparent anytime he mentioned a fact or tidbit about Angkor or Cambodian culture, which clearly made him happy to speak about. Also, I am not sure if every guide is this way, but Mr. Raty had a memory for specifics and dates that rivaled any academic I’ve ever met- all while speaking 5 languages! You’ll hear some of the more interesting facts about Angkor Wat in the video, but since this is a syncing of hours of film footage and it has to be attention grabbing (thank you Tony Capelli! ), I thought I wouldn’t make the video too audio heavy- the visuals of the temples tend to speak volumes more than I ever could. The interview with Mr. Raty however was important, and while I am still honing my interviewer skills, he was very eloquent while speaking about the affects of tourism and globalization on his community near Angkor. From his answers, we see that it’s a push-pull type relationship between the locals and foreigners- which I suppose is to be expected. The benefits of places with an abundance of tourist opportunities, like Angkor, means that the economy will grow from a natural resource (in this case, a UNESCO World Heritage Site) and the locals will see immediate benefit from a growth in labor, infrastructure, investments, resources etc because the presence of foreigners demand those things. However, on the opposite end of the spectrum, as Mr. Raty pointed out, foreign influences come with baggage, like religious holidays (in this case it was Christmas) or out-of-place foods like Mexican taquerias, and even more serious is the pollution, a divide between those able to benefit from direct contact with tourists and those who are less monetarily affected, deforestation, wear and tear and safety of the tourist site for posterity, amongst other issues. In 2013, Angkor Wat experienced an excess of 2 million visitors (not Cambodia as a whole, just this site) with a steady nearly 20% yearly increase. I am certainly no economist, but there is an obvious constant struggle between maintaining massive historical sites like this temple complex for future generations of visitors, archaeologists, and other knowledge seekers, while still being able to reap the benefits of open access in the present day for millions of current visitors. As interesting as visiting this site was for me, it was more interesting hearing the perspectives of the local people that we encountered. Our tuk-tuk driver moonlighted as a tourist driver even though he has a full time job as a police officer. But they only get paid 90$ a month(!) for that, which isn’t enough to support his new wife and baby, he said that he gets 20$ a day to be a tuk-tuk driver around the site to supplement his income. Mr. Raty said he dreamed of traveling outside of Cambodia for the first time. Some people near the reflection pool (classic photo-op spot in Angkor Wat) who were visiting from another Cambodian province where there are no tourists, asked my friends to pose with them in photos in order to show their friends/family back home that they met ‘tourists’. Our guide said they wanted to pose with Hannah and Paul specifically because most visitors from other provinces were equating being fair skinned with being foreign, and those photos would prove they had the means to travel to places where tourists frequented. Just briefly, for Southeast Asia and Cambodia, the temple complex at Angkor is one of the most important archaeological sites and was designated a World Heritage Site in 1992. Cambodia is in fact the only country to have a building on their national flag- and it is an image of Angkor Wat. The temple complex stretches over some 400 square km, throughout northwest Cambodia and contains the magnificent remains of the different capitals of the Khmer Empire, from the 9th century to the 15th century. Places that we were able to visit included the famous Temple of Angkor Wat (which translates to Temple City or City of Temples), and Angkor Thom and the Bayon Temple (which will be featured in Chapter Three of the series). Words do not describe how magnificent these ruins of a long-lost Empire reveal themselves to visitors- calling it ‘stepping into the past’ could not be more literal. The imagination truly has the chance to run wild there, where tales of kings and gods of old become more real with each step up the stairway to heaven…. Please stay tuned for Chapter 3 in “Global ArchaeoVentures: The Diver Travels to Cambodia” also known as “An ArchaeoVenture to Cambodia” where the story at Angkor Wat continues. – BBC News: Are there too many tourists at Angkor’s temples? November 9, 2014 was the 25th anniversary of the fall of the Berlin Wall – an event many would argue as a major turning point toward a more unified Germany, more unified Europe, and a more prosperous West – its destruction overall. Few today would argue that the Berlin wall should have remained intact. Yet, will archaeologists hundreds of years from now consider the destruction of the wall a loss of important tangible heritage? Only time will tell. But today, as nations the world over work to have pieces of cultural heritage repatriated to their homeland, it may seem contradictory that we laud the sale or loss of some of these items yet celebrate the sale of others, in particular pieces of the Berlin wall. On the one hand, the argument can be made for the sale of such a (literally) dividing piece of history in the sense that it empowers a people to reclaim their society and take back their freedoms. However, once this history becomes antiquity will future minds have changed about the sale of this major portion of history? Even decades later, past tourists are returning pieces of monuments such as those at Pompeii – yet at the same time a piece of the Berlin wall can be found on eBay. But admittedly, Europe is not my forte – so let’s look at an example that may have more resonance with the current era: the toppling of Saddam Hussein statue in Baghdad’s Firdos Square on April 9, 2003 after the US invasion of Iraq. You’ve seen this scene before – from the invaders of ancient history conquering their enemies, to the demonstrators of Ukraine protesting communism today, to the destruction of ancient societies by modern ones – such as the recent campaign of ISIL today. Why is it that we lament the losses from destruction of the ancient world, while lauding the same types of destruction for monuments today? Perhaps it is the fact that some believe that time can make something valuable. Yet, if an object’s worth appreciates with time – are we then undermining the value of our future by not lamenting the destruction of modern history in the same way that we condemn the destruction of our past? Should we only be condemning the demolition of our past and not our future? Who should determine what is ok to destroy and what is not? These are questions with many answers, and we are looking to you to send us your thoughts! Archaeology in Pop Culture: Helping or Hindering the Discipline? When most people hear “archaeology” one of the first things that comes to mind is Indiana Jones. How is it that a pop culture icon became the mascot of a scientific discipline? 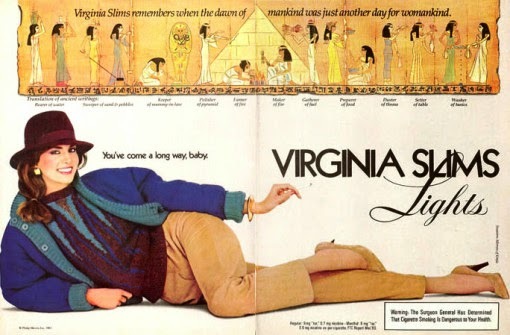 Archaeology – and all of the romanticized tales of ancient mummies and temples that come with it – has been entwined in pop culture since people first began literally digging into our history. In the late nineteenth century, common fads for elites involved “mummy unwrapping parties.” Although today many would see this as a desecration of a deceased person, most elite Victorians didn’t see anything wrong with damaging pre-Christian bodies. Mummies were simply a curiosity of the orient. But as the study of the ancient Near East became a common place academic discipline – particularly after the deciphering of the Rosetta Stone in 1822 by Jean François Champollion – archaeology found its way into the imaginations of the West and the increasingly developing world of popular culture. 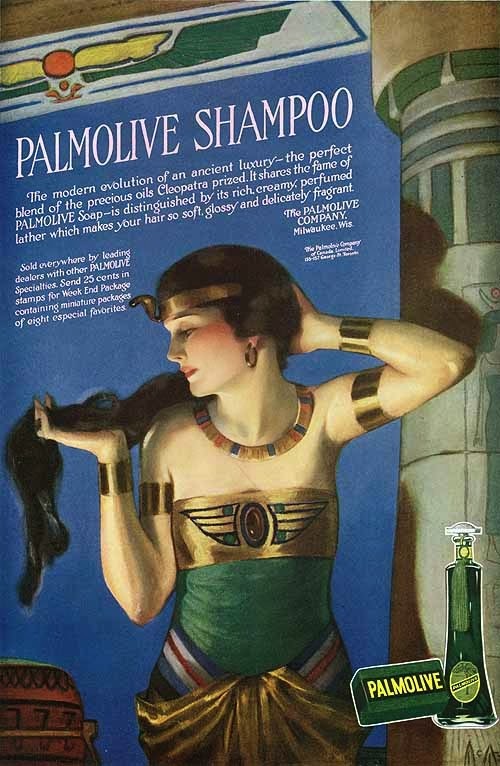 Ancient Egypt was used to sell everything from cigarettes to soap. And it carved out its own niche in Hollywood well before the days of Indiana Jones and Tomb Raider. Elizabeth Taylor’s famous role as Cleopatra is still well known in popular culture today as one of the iconic images of Cleopatra – never mind that many historians believe that it was not physical beauty, but wit, wisdom, and womanly cunning that made the real Cleopatra a legend of history. In reality, she is an example of what women should be valued for in society – their intellect and strength of character – but this was not the idealized beauty that Western culture wanted to portray. Politics of women in history and Hollywood aside – one question remains: do the common misconceptions created by archaeology in popular culture hinder or help the overall discipline? Some may think that if the public is going to learn about archaeology or history is should be with accuracy from the beginning. However, here’s my person opinion: As someone who began studying the discipline just at the cusp of the recession and finished grad school with the effects of an economic crisis in full swing, I must say that anything that gets the public interested enough in a discipline to patronize a museum or donate to an archaeological excavation is something worth containing. Most people get into a science one way or another based on a romanticized view of what it is. Unfortunately, cut backs in government funding for research and an economic crisis that has made many funding sources at foundations and universities tighten their belts means that other routes of funding must be sought. But this is a debate that can go on forever – so what are your thoughts on archaeology in pop culture? Does it damage the mind of the public or expand it?Crowd funding has become a new means of revenue for archaeologists to seek in gathering funding for their research. But with a source of funding that relies on the public, archaeologists must be able to appeal to the internet world’s non-scholars to get their attention – and of course dollars. This kind of appeal would not be nearly as effective if it weren’t for all of the fantasized, glorified, and heroic archaeology adventures that Hollywood and western culture portray – regardless of how inaccurate it is. Those inaccuracies provide an opportunity to grasp the imagination of the wider public and engage them in a way where those misinformed interests can be put to rest in the name of science. 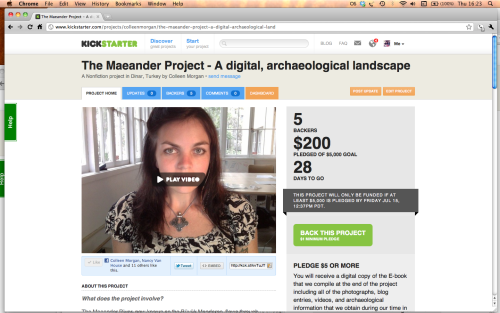 Crowdfunding Archaeology some Data, Finally! Revising Antiquities Laws- Does it Put a Stop to Illegal Looting? There are many outdated laws and regulations concerning heritage and site protection around the world. However, with their recent change in government, India has recognized the necessity of revisiting their cultural resources legislation. The Archaeological Survey of India (ASI) has decided to push for an update to their 1972 Antiquities and Art Treasures Act (AAT). In their belief, this Act has encouraged illegal looting of Indian antiquities and has made it more difficult for legitimate persons/dealers to obtain licenses for private antiquities ownership. While there is no ban on private ownership of antiquities, one must still obtain a license/submit registration to own them. The ASI has argued that if the law is updated, the black market for illegal items will slow down, bringing more transparency to their legal domestic trade. The ASI has previously attempted to change the law to be more compliant with their view, but so far their efforts have been stonewalled. If the ASI were in fact able to pass a new Act or an updated version, does this actually indicate that illegal looting will subside? Or, will it merely make it easier for those persons who already want to abide by the AAT law to comply, and not in fact dissuade those looting for subsistence or other fraudulent reasons? It isn’t inconceivable that once registered, these items, because of their new transparency to the government and other dealers, will become targets for seizure by the state or museums. In that same vein, people may be persuaded by the availability of permits and amplify their search for archaeological sites and artifacts. To be clear, I am certainly not arguing that the ASI should not attempt to update these laws- this law created in 1972 must be revisited by Indian lawmakers and heritage managers. However, I play the devil’s advocate when I question whether or not this will in fact make a marked improvement on looting in the country. Perhaps an educational component about the economic incentive fueled by cultural tourism, in addition to the mere redrafting of legislation, would encourage those Indian citizens to become stewards of their own heritage, instead of incentivizing them to own/sell. Here is an update to my post about Barry Clifford, the treasure hunter who discovered the Whydah and ‘discoverer‘ of what he believes to be Christopher Columbus’ flagship, the Santa Maria. This post is also featured on The Antiquities Coalition blog posted on Monday, July 14th 2014. Minister Rocourt also pointed out that although Clifford had announced to the public that he had discovered this site, it had actually previously been studied by the University of Florida back in the 1970s-80s. Maritime archaeologists – trained academics and scientists – who don’t harbor the same focus on profit and fame over proper research, would have done their due diligence by conducting a full research analysis and likely have left Christopher Columbus out of the equation, until there was concrete proof of this allegation. As to the ‘state of emergency’ invoked by Clifford concerning this site, the Haitian Government and UNESCO have also rejected this claim, as the wreck remains protected by the natural elements and sediments, meaning immediate danger is not imminent. Doing a full excavation would do more harm than good in both the short and long term. The Council has cautiously recommended that some archaeological fieldwork will continue on this site but only under the auspices of UNESCO’s technical assistance. Their team will likely survey the site in August of this year. This is an example of what many maritime archaeologists face – their efforts are not only focused on research but on struggling to counteract the claims and extensive financial flows of treasure hunters worldwide. It is governments in the developing world that need to recognize the difference between claims of grandeur and hard scientific fact. Even small decisions to restrict actions by alleged archaeologists; help foster a scientific and knowledgeable environment. This situation becomes even more interesting beyond the Santa Maria discovery. A simple news search shows that media coverage of this decision has only been covered by Haitian or foreign language media outlets. Once the initial announcement via the mass media was released in May to the American press, there has been little to no coverage of these developments since May in English-language outlets. This illustrates a trend in American sensationalist media where only the exciting or provoking news is made public, while the follow-up stories that are grounded in reality, are forgotten or dismissed. If the American public were able to know about why Clifford’s permit was revoked or why treasure hunters and archaeologists are ethically at odds, it would foster a new thoughtful perspective on cultural resources management and site preservation. The media is an integral part in spreading awareness of issues surrounding our cultural resources. their technical assistance to determine the validity of Clifford’s claims and assess his permit and archaeological methods. UNESCO has since determined that the methodology and diver team employed by Clifford does not comply with the standards set by the Scientific Council of the UNESCO Convention. Grandiose Archaeological Claims: Do they Help or Hurt the Discipline? The media has always thrived on the next ‘big’ archaeological discovery- whether the claims are made by amateurs or professionals, the media circus remains the same. We as the public, crave a connection to our history and heritage, regardless of initial authenticity. Some dubious examples that come to mind are the Etruscan terracotta warriors, the James Ossuary, the Kensington Runestone, or more recently a British maritime archaeologist claiming to have found missing flight MH370 thousands of miles from the search zone. One particular story that has recently grabbed media attention is the purported ‘discovery’ of the Santa Maria, the largest of three ships sailed to the New World by Christopher Columbus in 1492. The discovery was announced by Barry Clifford, who in several articles, is classified as a maritime archaeologist, while in others, as an underwater explorer. Make no mistake, Mr. Clifford is not an archaeologist. He may certainly claim to be one, but his career has been built upon the salvaging of shipwrecks around the globe. The practice of shipwreck salvage is not applicable to the protection and recovery of evidence relating to submerged landscapes and resources, and is by no means, archaeology (not to be confused with rescue archaeology which is legit). However, with all of these mainstream news outlets describing him as an archaeologist, it gives a level of recognition and legitimization to his claim that he wouldn’t have otherwise, regardless of how the archaeological community feels. With several historians and scholars already refuting his claim, I am not concerned with whether it is or it isn’t the Santa Maria. Most certainly, a shipwreck has been found, and has been investigated since 2003, but whether it is indeed the Santa Maria is certainly too early to determine, if at all possible. Although, UNESCO and the Haitian Government are taking the claim very seriously. As a maritime archaeologist, I know firsthand how long it can take to identify submerged remains, if one can ever say for certain. What worries me about this trend with fantastical archaeological claims, is that it seems to be intended more as a PR campaign vs. grounded in scientific reality. Clifford isn’t sure whether this is Columbus’ ship, but now, he will never run out of funding sources. As a business strategy, follows the typical commercial salvage investor model (Kleeberg 2013), but as a pseudoscientist, it seems fraudulent. - Do you think these unsubstantiated discoveries that capture the public’s attention help or hurt the archaeological discipline?